So said Ruby, aged 5. Young children’s minds wander, wonder, explore, invent, dream and try to work things out. They’re fascinated by the things around them but, as yet, their thinking is not ordered by the way society works and thinks about things, or at least not as much as our adult minds are. In the space of the time it takes to say one short sentence, that child imagined themselves being an inanimate piece of food, an animal, a sound, an aesthetic physical object and then finally, paint. And she was interested in paint, partly because of its colour and paintyness, and partly because it lives forever. Of course, even with science progressing apace as it is today, Ruby is unlikely to end up as a horse or a sweet. But the fact is that the diversity of careers and employments today is far greater than it was when anyone reading this was aged five. There are often good reasons behind these – the need to be comparable across the country, the need for schools and employers to understand qualifications - but they are only part of what children will need. With the future diversity of employment, we don’t need a small number of people who are best at a small number of things and a whole lot of other people who aren’t as good at them; we need everyone to be exceptional at the different things they could be. Very few people can be best; everybody can be exceptional. Exceptional is not second to best; it's just individual. Whereas best is, necessarily, exclusive. And what’s this got to do with music in the early years and with musical progression? Well, when people think about progress and progression they invariably have in their minds some kind of destination. Eh? I think you can define these two nebulous terms very simply: progress is getting better; progression is moving forward. The key questions then tend to be “at what?” and “towards what?”. “What should we be looking for children to get better at?” “Where do we want children to have progressed to by the end of the year?” And to think in those terms means, in most cases, that you have to think about defining your destination points: e.g. we’d like children to be able to read, to get GCSE grades, to sing in tune, to have professional qualifications, etc. In the long term, I’ve suggested, we really don’t have much idea about what those destination points are: the career ladder has turned into an entrepreneurship cloud. But the same principle operates on a much more immediate level too. If we worry too much about where we’d like children to get to, we’ll probably miss out on what they actually can, or could, do. Think of a musical person. You probably have in your mind a singer, instrumentalist, pop star, orchestral musician, rap artist etc. ; probably not an accountant who hums in the shower; probably not a two-year-old who taps everything she finds to hear what sound it makes. Being musical is much more than being a recognisable musician performing on a stage but it’s this image that most immediately comes to mind when most people think of a musician. But very few people don’t enjoy listening to music or can’t say what particular kinds of music they do and don’t like. A miniscule proportion of people have a rare condition where the presence of music provokes an immediate strong reaction of disgust or discomfort. Another rare condition – musical anhedonia – means that roughly 3% of people have little or no emotional reaction to music. And only about 4% of people are actually ‘tone deaf’ in the professional estimation of acoustic scientists – far fewer than will tell you they think they are. Think, for instance, how much musical thinking you do every time you interpret someone’s sentiment from the tone of their speech. These are the three abilities – aural perception, musical pattern recognition and analysis, and accurately imitating sounds – that are essential musical attributes. If virtually all children are born musical, what if we – parents and educators – knew how to and wanted to help them develop that musicality - not all of them to be musically the best, but musically exceptional as themselves? The first person is trying to spark up a conversation with the second person. But the second person doesn’t understand and just keeps on repeating the first person with patronizing compliments and tone of voice. After a while, the first person gives up. This can happen between a young baby and a parent: the baby is trying, not just to make a sound, but to communicate and set up a dialogue. But the parent doesn’t understand and just imitates. After a while the baby gives up. This is not the space to go into child-centredness but I don’t think a discussion about progress and progression should go without mentioning the importance of purpose and motivation. Put simply, people learn most effectively when they themselves have a purpose and motivation to learn. 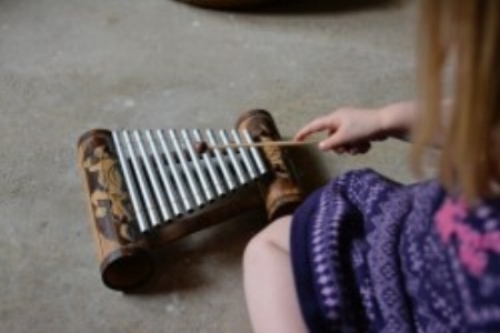 Conversely, if children are in an environment with interesting and beautiful instruments and objects that they can explore, perhaps with some guidance and suggestion from an adult, they may be minded to find out about instruments and how to play them. If children can see that adults recognise and value their musical experiments, that recognition and praise will motivate them to continue and develop. If children are inspired by ideas and demonstrations they may be stimulated to try new things themselves. The purpose of music in education? But, in this context, I wanted to mention how I see, or predict, and perhaps hope, that music, the arts as a whole, and creative expressive practice will, or could, play a vital role in children’s futures. Of course a small number of children will grow to become those highly recognisable performers on stages that I talked about earlier – the most obvious musical manifestations. But most won’t. The fact that most won’t, and also the fact that some parents and educators (and mortgage providers, it seems!) don’t value being a musician very highly as a career, sometimes means that music, as with other arts, are often seen as nice-to-have but not essential. It looks like children who are growing in their ability to express themselves through music, to explore and develop their musical ideas and imaginations, to use their voices and instruments with increasing sophistication and enjoyment. It looks like children who listen attentively and explore a widening range of music, musical sounds and experiences, and to make music, in all its forms, with other people – children who are discovering their individual musical selves and how they can use music across their lives.